68 M T D J a n u a r y 2 0 1 9 F o c u s O n I n d u s t r y A rvind Poddar, chairman and managing director of Balkrishna Industries Ltd. (BKT), was unable to attend his induction into the Tire Industry Association Hall of Fame on Oct. 29 due to a death in the family. But that didn't keep him from making a huge announcement with global impact. "We have a concrete plant to set up a new tire plant in the U.S., generating local employment," Poddar said in a pre-recorded speech during the 2018 Tire Industry Honors program in Las Vegas. 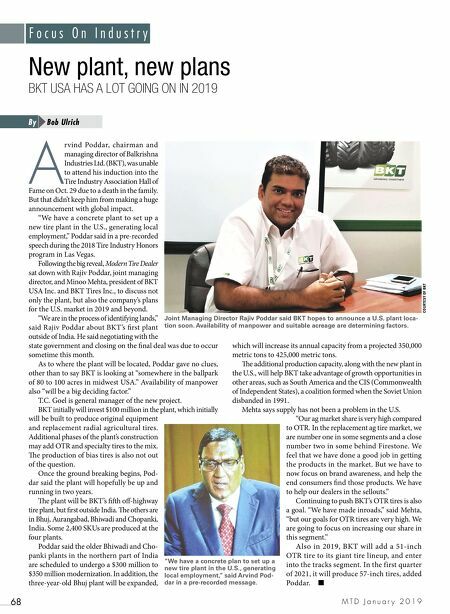 Following the big reveal, Modern Tire Dealer sat down with Rajiv Poddar, joint managing director, and Minoo Mehta, president of BKT USA Inc. and BKT Tires Inc., to discuss not only the plant, but also the company's plans for the U.S. market in 2019 and beyond. "We are in the process of identifying lands," said Rajiv Poddar about BKT's first plant outside of India. He said negotiating with the state government and closing on the final deal was due to occur sometime this month. As to where the plant will be located, Poddar gave no clues, other than to say BKT is looking at "somewhere in the ballpark of 80 to 100 acres in midwest USA." Availability of manpower also "will be a big deciding factor." T.C. Goel is general manager of the new project. BKT initially will invest $100 million in the plant, which initially will be built to produce original equipment and replacement radial agricultural tires. Additional phases of the plant's construction may add OTR and specialty tires to the mix. e production of bias tires is also not out of the question. Once the ground breaking begins, Pod- dar said the plant will hopefully be up and running in two years. e plant will be BKT's fih off-highway tire plant, but first outside India. e others are in Bhuj, Aurangabad, Bhiwadi and Chopanki, India. Some 2,400 SKUs are produced at the four plants. Poddar said the older Bhiwadi and Cho- panki plants in the northern part of India are scheduled to undergo a $300 million to $350 million modernization. In addition, the three-year-old Bhuj plant will be expanded, which will increase its annual capacity from a projected 350,000 metric tons to 425,000 metric tons. e additional production capacity, along with the new plant in the U.S., will help BKT take advantage of growth opportunities in other areas, such as South America and the CIS (Commonwealth of Independent States), a coalition formed when the Soviet Union disbanded in 1991. Mehta says supply has not been a problem in the U.S. "Our ag market share is very high compared to OTR. 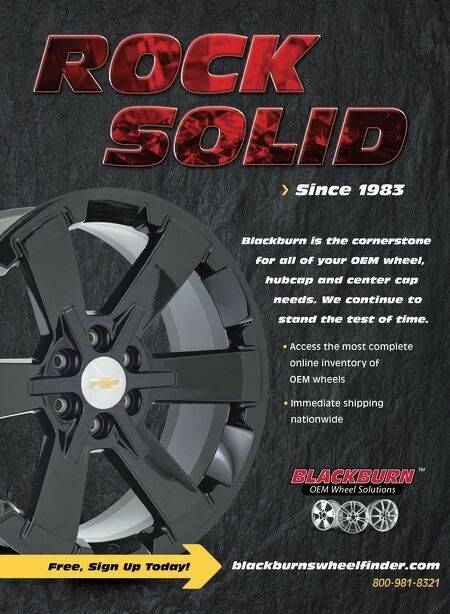 In the replacement ag tire market, we are number one in some segments and a close number two in some behind Firestone. We feel that we have done a good job in getting the products in the market. But we have to now focus on brand awareness, and help the end consumers find those products. We have to help our dealers in the sellouts." Continuing to push BKT's OTR tires is also a goal. "We have made inroads," said Mehta, "but our goals for OTR tires are very high. We are going to focus on increasing our share in this segment." Also in 2019, BKT will add a 51-inch OTR tire to its giant tire lineup, and enter into the tracks segment. In the first quarter of 2021, it will produce 57-inch tires, added Poddar. ■ New plant, new plans BKT USA HAS A LOT GOING ON IN 2019 Bob Ulrich By Joint Managing Director Rajiv Poddar said BKT hopes to announce a U.S. plant loca- tion soon. Availability of manpower and suitable acreage are determining factors. COURTESY OF BKT "We have a concrete plan to set up a new tire plant in the U.S., generating local employment," said Arvind Pod- dar in a pre-recorded message.